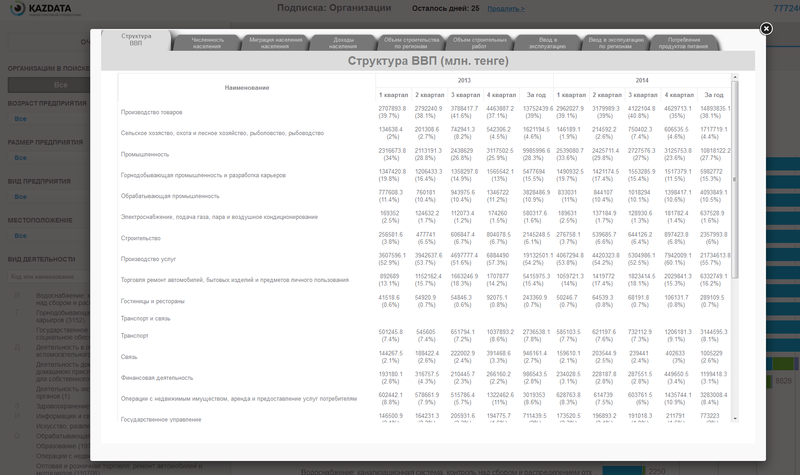 Now you can get information on major Kazakhstan development indicators from market business Catalog KazDATA. Indicators are available for all subscribers in each Catalog module. Just click the icon with diagram on the right side of the window. Right on the screen you will see pop-up window with indicators. You can select the interested ones and set period of time. The view of pop-up window in "Indicators" module. In order to close "Indicators" press cross in the top right corner of the window. Один из участников бета-тестирования, работающий бизнес-аналитиком в консультационной компании, Максим Боровиков, поделился своими впечатлениями от использования. KazDATA — маркетинговый бизнес-справочник для оценки рынка и поиска клиентов в Казахстане. 24.07.2016 - Добавлены исторические курсы валют в наглядном виде. Quickly search the market. Save your time. Empowered with Information Prepared for Action!